"Sad mortal: good and evil have no bearing here. There is only instinct, love, hunger, or fury..."
The bright mirror of the fey world has long fascinated mortals. A place of impossibly tall snowcapped mountains, where living mists dance among the twilit boles and still dark pools reflect thousands of stars in strange constellations, the unknown lands of the fey are as beautiful as its folk are deadly. Herein you will find the Four Courts of the Fey, learn legends of their timeless magic, travel to their greatest cities, and hear tales of their ancient histories. 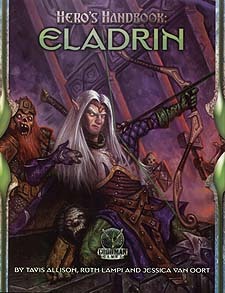 For whether participating in their famed revels, taking part in their dread hunts, or beseeching their four courts, no hero treads lightly in the realms of the eladrin. Rich with culture, new magic items, monsters and character options, Hero's Handbook: Eladrin is the essential eladrin player's resource. Second in a complete line of PC aids, each brings character, history and new depth to your player character.